When staffing an onslaught of incoming and active projects, it's tempting to try to "fill in the gaps," assigning resources to meet the stated skill needs. But if multiple projects are clamoring for the same resources (and let's face it, they usually are), which projects take precedent? This is where priorities come in. Resources (or teams) should be allocated to projects in priority order (and ideally, your software will accommodate this automatically). This way, if a lower priority project needs certain resources and they've already been assigned to a higher priority project, well, that's exactly as it should be. Conflicts can then be discussed if need be, and priorities can be reexamined. But it's more than just that. Priorities should determine the incoming projects to begin with. All planned strategic and business initiatives should be in support of defined and prioritized strategies and goals, and should be submitted with a relative priority (this is where portfolio review meetings come in handy). Ensuring projects are prioritized also avoids the case where individuals find themselves overloaded and begin to prioritize their workload. 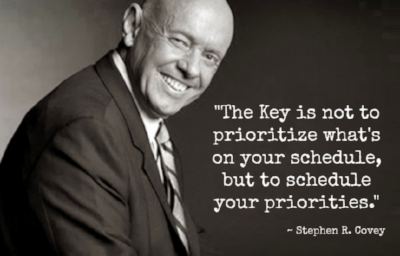 Stephen Covey said, "The key is not to prioritize what's on your schedule, but to schedule your priorities." There's a subtle difference, and it's all about whether you want to be in reactive mode or proactive mode. In other words, rather than operating in reactive mode by prioritizing an incoming list of initiatives (many of which are often submitted based on the idea du jour or the "squeaky wheel" syndrome) or a schedule of activities, focus first on your organizational priorities and then proactively schedule activities to deliver them (taking into consideration your finite resource capacity of course). Then, resources can be allocated in accordance with each initiative's relative priority. In essence, the time to think about priorities is when the projects get submitted, not after you have your daily to-do list. The project priorities should determine individual and team priorities. Newer PostSimplicity Gets Things Done. Plain and Simple.